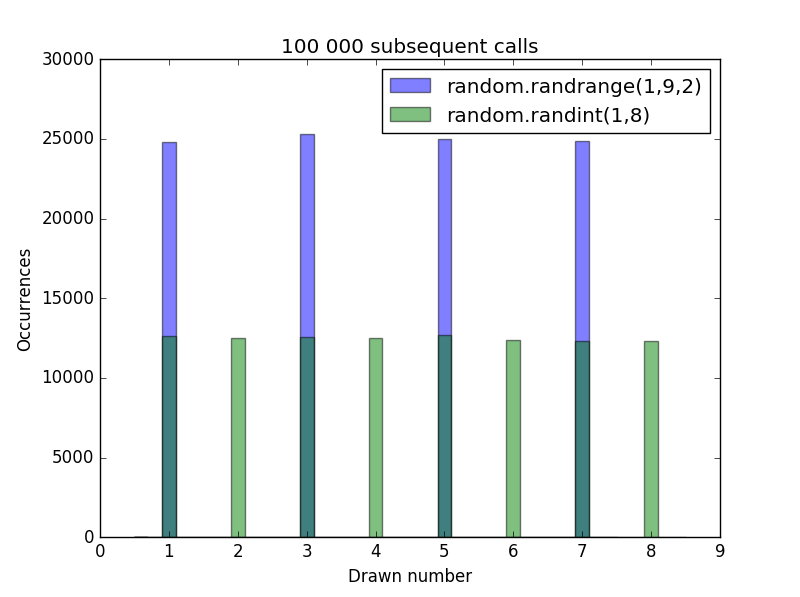 By default the Python random module use the Mersenne Twister PRNG to generate random numbers, which, although suitable in domains like simulations, fails to meet security requirements in more demanding environments. In order to create a cryptographically secure pseudorandom number, one can use SystemRandom which, by using os.urandom, is able to act as a Cryptographically secure pseudorandom number generator, CPRNG. The easiest way to use it simply involves initializing the SystemRandom class. The methods provided are similar to the ones exported by the random module. and, accordingly for all other methods. The interface is exactly the same, the only change is the underlying number generator. You can also use os.urandom directly to obtain cryptographically secure random bytes. Remove either of these to create a pool of symbols with fewer elements. Note that other routines made immediately available by the random module — such as random.choice, random.randint, etc. — are unsuitable for cryptographic purposes. Behind the curtains, these routines use the Mersenne Twister PRNG, which does not satisfy the requirements of a CSPRNG. Thus, in particular, you should not use any of them to generate passwords you plan to use. Always use an instance of SystemRandom as shown above. Starting from Python 3.6, the secrets module is available, which exposes cryptographically safe functionality. # Out: ["He", "Hi", "Ho"]  # Output may vary! # Out: He                  # Output may vary! # Out: ['Ho']                    # Output may vary! print(random.sample(laughs, 3))  # Take 3 random element from the sequence. # Out: ['Ho', 'He', 'Hi']        # Output may vary! print(random.sample(laughs, 4))  # Take 4 random element from the 3-item sequence. random.seed(5)                 # Reset the random module to the same fixed state.